This great game contains 55 cards beautifully-illustrated by Rikey Austin, created to help develop observation, memory and recall skills through everyday concepts with the Teddy Bear characters, from playing football to building sandcastles. The object of the game is to study a card for 10 seconds and then answer a question based on the roll of a die. If the question is answered correctly, the card is kept, and the person with the most number of cards after 5 or 10 minutes is the winner. 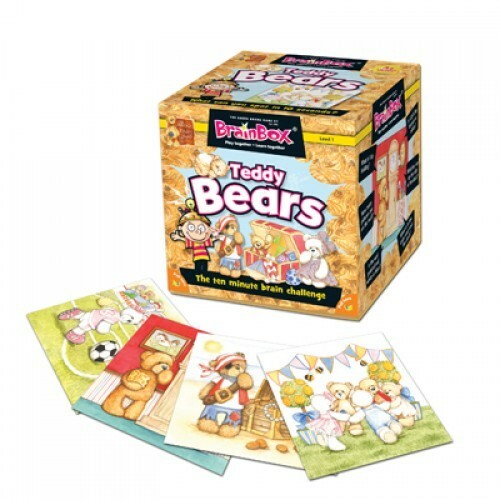 Made from a minimum of 70% recycled material, the BrainBox range is fabulous fun. Find out who the BrainBox is in your family it may not be who you think it is!